2017 is shaping up to be one of the best years for potential home-buyers. The GST bill has reformed real estate investments and interest rates are going down. If you’re looking to invest in real estate, you can’t go wrong with Chennai, one of the top twelve rising realty destinations in the world. The city has one of the fastest growing IT sectors in the country and a thriving automobile industry. Apart from the main city, however, areas in the outskirts of Chennai are soon becoming leading real estate destinations. 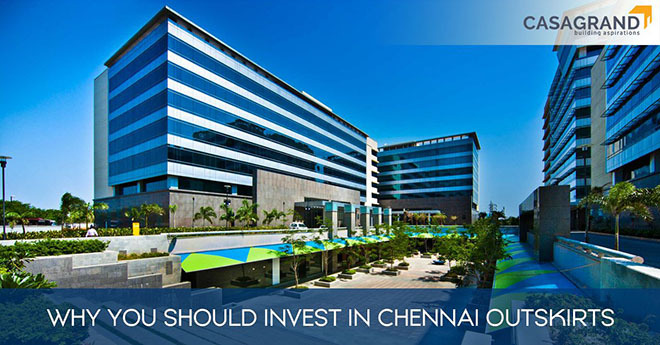 Here are five reasons why investing in the outskirts of Chennai is a good idea. Chennai is quickly becoming the top city in India for IT development and manufacturing. Most of these companies are concentrated in areas like Oragadam, Sriperumbudur and OMR. There are currently over 100 companies in Oragadam alone, offering over 3 lakhs jobs. The proposed Oragadam financial city will create 30,000 additional jobs. The outskirts of Chennai are dotted with SEZs for electronics and automobile manufacturing. The influx of investments in the outskirts has pushed the state government to develop these areas and improve infrastructure. Rapid development has also led to several schools, colleges and medical facilities opening up. Most of these areas have become fully self-sufficient, so you will be lacking for nothing. The distance between the outskirts and the main city might seem big, but they are very well connected. The ease of connectivity is one of the main reasons why properties in the outskirts of Chennai will only appreciate with time. The Old Mahabalipuram Road (OMR) is a beautiful six-lane road that connects the city places such as Sholinganallur. OMR’s unbeatable connectivity is one the main reasons why it is the best place to own your home. If you’d rather take public transport, Chennai has an extensive bus network, with frequent buses which make your travel much easier. There are also trains that run from the suburban areas which will drastically reduce your travel time. The proposed Greenfield airport in the outskirts of South Chennai will make these areas even more accessible. Land rates in the outskirts of Chennai are much lower than they are in the main city. You can get a much larger apartment or villa in the outskirts for a very affordable price tag. Apartments in these areas also have several luxury amenities that most apartments in the city lack. The low prices of property in these areas are a big reason for why they are a prudent investment. For a comparatively low price now, you will soon be making high returns on your investment in the future. The development boom in the outskirts of Chennai has brought in people from all parts of the country to work in companies situated here. If you invest in real estate near areas like Oragadam or ECR or OMR, you will have no shortage of tenants. Most companies try to find accommodation for their employees in nearby localities to save on transport costs. This means that if your property is located near these districts, you can be assured of a steady supply of tenants. If you’re looking to buy real estate only as an investment, for now, the outskirts of Chennai are your best bet. With a population constantly on the rise, the city of Chennai is slowly growing. The Housing and Urban Development Minister of Tamil Nadu has announced that the city will be growing from its current 1,189 sq. km to 8,878 sq. km in the future. This means that in a few years, the outskirts of Chennai will not technically be its outskirts anymore. A property investment in the outskirts today will give you major returns once these areas become a part of the main city. Buying real estate in the outskirts of Chennai is one of the best investment decisions you can make. If you are looking for a new property, read our extensive guide to make sure the property you buy is legally clear and useful Gruhapravesam tips for your new home. Check Casagrand for spacious luxury villas with unmatched amenities.